Sip soft drinks all day, and get decay. A strong link exists between soda consumption and tooth decay. 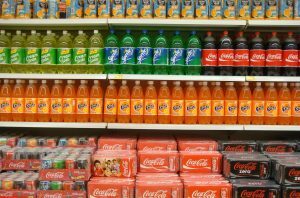 Additionally, habitual soda consumption can lead to childhood obesity, diabetes, and behavioral problems. Acids and sugars both damage and soften tooth enamel, leaving it susceptible to tooth decay and even tooth loss. The sugar in soda combines with the bacteria in your mouth to form acid. This acid and the acid already contained in soft drinks weakens tooth enamel in people of all ages. Every time you take a sip of a soft drink, the acid and sugars attack your enamel. These ongoing attacks can eventually lead to cavities and tooth loss. Kids and teens are most susceptible to tooth decay because their tooth enamel is not fully developed. Limit children’s consumption of soft drinks: Keep water, milk, and 100% fruit juices in the refrigerator. Drink these yourself and encourage your children to do the same. Use a Straw: Using a straw keeps the sugar away from your child’s teeth. Rinse with Water: After drinking a soda, make sure your child rinses with water to dilute the sugar and acids. Use Fluoride Toothpaste: Fluoride reduces cavities and strengthens tooth enamel. Rinsing daily with a good mouthwash will also help combat tooth decay. Soft drinks are hard on your teeth. By reducing consumption, practicing good oral hygiene, and checking up with your dentist, you can help prevent tooth decay in your family. The first signs of tooth decay include toothaches and sensitivity to hot/cold. If you or your child experiences these symptoms or has questions about the effects of soda on oral health, please call or make an appointment with your Longmeadow dentist today. Medication, bandages or other therapeutic material applied to a wound.